A friend of our local Carmelite monastery has advised me that the nuns are in need. The crisis that has hit our church has taken a toll on them, and most severely because Apuron blabbed about the donation which paid off the bank loan for the Yona property. Because the donor (stateside) was sourced through the Carmelites, people think that our local Carmelites are supporting the Neos. 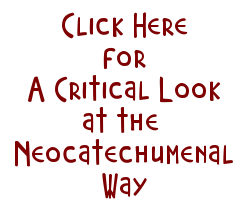 In fact, as you can read in THE ULTIMATE TREACHERY, Apuron tried to coerce a Carmelite superior into signing a letter stating that the nearly 2 million was given specifically to establish a Neocat seminary. As you may recall, the Carmelite superior declined to sign it, telling Apuron that she could not sign the letter because "it was not true. I will now be supporting the Carmelite Nuns instead to the Church. I have heard this that "OJ" can do what ever he wants with the donation. Let us help the Carmelite Nuns by giving for Anamas mass and Inbida mass. If you give money for a mass, then they may feel obligated to give that money to the priest, so maybe we should just give them money for general expenses. 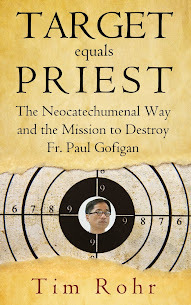 Concern: It would be good to know if our beloved Carmelites on Guam are being coerced to send monies they receive from the faithful to the neocathecumenal way thru the Chancery, as well? Or, even thru the “neo Carmelites” in the mainland? Is the Carmelite community on Guam affiliated with the neo Carmelite community in the mainland? Certainly this evil is impacting everyone in our local Church at all levels; therefore it’s understandable that monetary donations to any religious entity or community on Guam will also feel the monetary scrutinies which potential or likely donors may be making of these religious entities on Guam who are under this Archdiocese at some level or manner. As much as we all detest the actions and decisions of Apuron we pray for one another and for spiritual discernment/guidance. What truly is at stake in this whole Church affair is the perdition of souls! I can confirm that no money goes from the carmelites to the chancery or the ncw. Also, all donations stay with the community to whom they are sent for their needs. If the Carmelites here were affiliated with the ones in New Jersey, would the Skunk of a monk be sending the girls off island? For those whose parishes have been taken over by NCW-Cult presbyters, transferring one's weekly offertory to the Monastery would be an exemplary action to avoid formal cooperation with evil, while at the same time upholding one's Christian stewardship obligation to support the local Church in keeping with our means. @1:41PM To get the answer you want, go to junglewatch Feb 27, 2014. Here you will see how the Neo, especially Ms Dynamite think about our Carmelites Sisters. Enjoy! They are neo's and I'm told they want to be in a neo-monastery run by Pius. My mother used to say the Archbishop paid the Carmelites bills. I haven't seen them since I was a child. This situation is confusing and disturbing. Carmelites are just another innocent victims of Apuron who are suffering for standing up for the truth and opposing the lies of this bishop. Clearly a vindictive and selfish person occupying the role of bishop in this archdiocese, a prime example of the fruits of the NCW. Thank you for that confirmation, Tim. The Carmelites here have NOTHING to do with Pius' New Jersey thing to which he ships off his Guam girls. The Carmelites here have been faithful and quiet prayer warriors for the protection of Guam since they were brought here decades ago to pray for our island. They have been used and abused by The Tony like everyone else. Violating the condition of anonymity of the donor unfairly linked the Carmelites here with RMS and has caused them great harm. Out of pure goodness, the Carmelites of Guam sought a donor to help the archdiocese form what they thought was going to be a real seminary and not a neo hack shop. Please try to help them however you can. There was a girl from Guam named Kika Martinez. Was she shipped off to NJ? Does anyone know? Millstones everywhere. This is a sick sick scandal. Judas at least kept it to money and hate for the Lord. These pricks like Pius are satanic (small "s") who desire the destruction of souls. One last things: for what it's worth, please pray for all of the true vocations who are being hi-jacked--Carmelites and perhaps more for these poor men at RMS who love the Lord and don't see their own destruction in the works. Pray for them. Fast for them. Pray to your 4 stigmata saints: Sts Francis, Catherine of Siena, Gemma of Galgani, and (the real saint) Padre Pio. Let us pray to them for these priests and brides of Christ. The Carmeite Sisters came to Guam 50 yrs. we used to get eggs from them. So sorry to hear Sr. Margaret Mary went to the Fathers house. We miss her so much. Idk her Carmelte name. Do the Carmelites have a more modern way to accept donations? Not that I know of, but perhaps some person of good will can work with them to devise an online way of being able to contribute. do they accept personal checks? to whom should they be made out? Make checks to Carmelite Monastery. I went to Mass there in November and Fr Rudy was the priest. Best to give donations to the Sisters directly. Many of us sad not to attend Mass at Carmelites. Father Rudy drives people away with his insults. Is that his job there?